Remember that Grassroots promotion…was it a gamble? Civil Servant Stuart Griffiths would certainly say no! 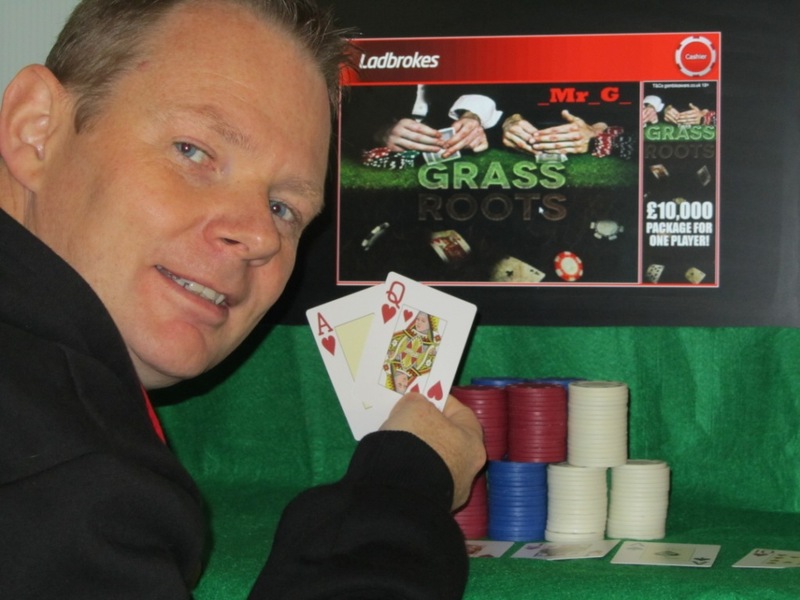 He was lucky enough to be selected for the Ladbrokes Poker Grassroots promotion, where they are searching for a ‘Grassroots’ poker player worthy of securing an amazing £10,000 sponsorship deal. You can read the blog post we ran about it here. Stuart, who plays under “_Mr_G_” and until now had only played online in small $10 MTT events was selected as one of the 40 qualifiers and progressed through the first stage with his social media enterprise; blogging and tweeting about the promotion. _Mr_G_ was then sponsored by Ladbrokes for the second stage where he played in The Vic’s £300 monthly main event. Here, in only his second live event, Stuart went on to knock out Neil Channing on the bubble and then secured 4th place winning over £1500. This has taken him through to the penultimate stage with Ladbrokes now sponsoring his entry fee into The Fox poker club’s new monthly £25,000 guaranteed monthly main event on 4th & 5th August. To see _Mr_G_’s journey so far and whether he secures the Ladbrokes Poker £10k sponsorship deal follow him on twitter @_Mr_G_ or read his regular blog at http://mrg27uk.blogspot.co.uk/. Ladbrokes Poker: Be crowned the Ultimate Grassroots Player for a £10,000 Sponsorship deal! Home » Rakeback News » Remember that Grassroots promotion…was it a gamble?